Handmade in Egypt, the Khalil Mamoon Basha Ice Chamber is created for ease of use and maintenance and to promote a traditional hookah smoking experience. 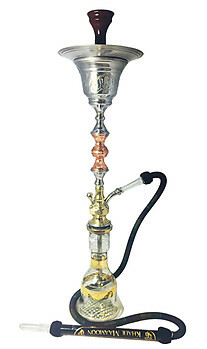 The KM Hookah includes a tri-metal stem with copper, gold and chrome along with a single hose setup, glass vase and ice chamber to cool the smoke. At 36? tall, this Khalil Mamoon Hookah towers with elegance.